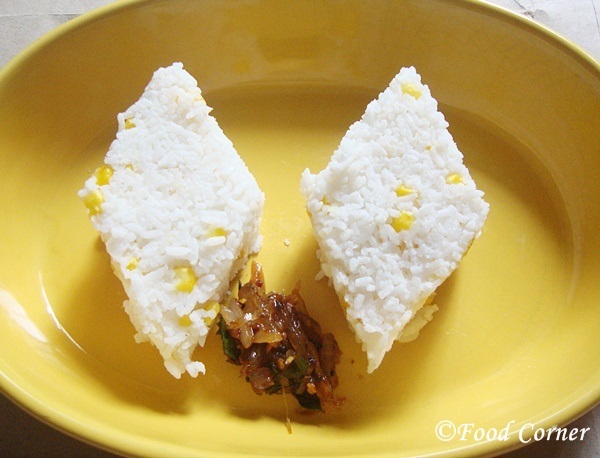 Kiribath (MilkRice) is a traditional food from Sri Lanka, Kiribath is our ceremonial food which we cook for any festival or special occasion. 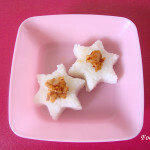 Even today, before start any work for the New Year 2013, I cooked Kiribath (Milk Rice) as our breakfast. I have shared Kiribath recipes before. 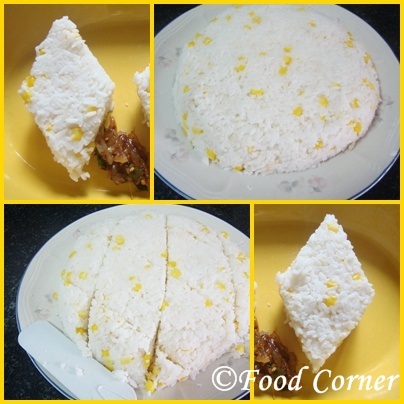 So I thought of sharing this Bada Iringu Kiribath (Milk Rice with Fresh Corn) recipe as the first post of year 2013.I’ve cooked this sometimes ago, but couldn’t post it here. 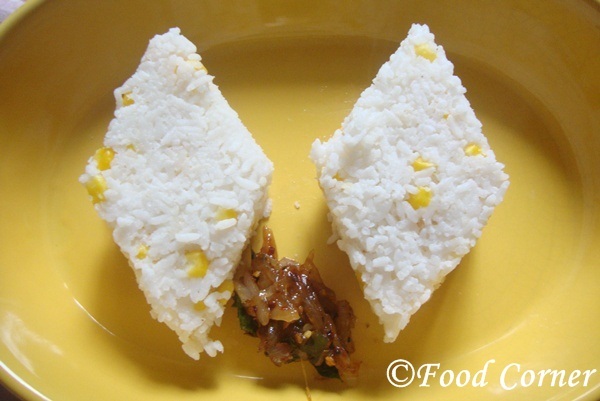 With this Milk Rice Recipe, I wish you all a Very Happy New Year with lots of prosperous and Happiness! And in this New Year, I have few things to achieve as a Food Blogger.I am in a cookbook project with Chef Duminda. Also I have started my own cookbook sometimes ago and again I have to hold it as I want to give priority for the Cookbook with Chef Duminda. My main aim to publish both Cookbooks within this year. 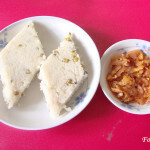 Yesterday, when I was thinking of my recipes which I have posted so far, I found that majority of recipes are from Sinhalese Community of Sri Lanka. 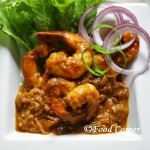 As a Sinhalese, my day to day cooking represents mostly Sinhala cuisine. In this New Year, I have a plan to share some more recipes from Sri Lankan Tamil Cuisine, Muslim Food, DutchBurgher cuisine and also from Sri Lankan Malay Community. Finally all these foods will represent Sri Lankan Cuisine. 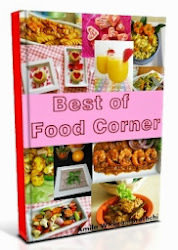 But end of this year, Food Corner will have a better collection of recipes to represent Sri Lankan Cuisine from different Sri Lankan Communities. 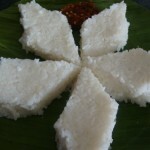 I have an open invitation to all Sri Lankan readers; please send me recipes from different Sri Lankan communities. I will try them at home and post the recipes here. (But I have some restrictions on some Meat and poultry) If you don’t have the complete recipe, just mention me the names from different ethnic groups.So,I will try my best to find the recipe. Wishing you all a Happy New Year and I want to thank for the support given me through comments and also as emails. 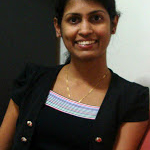 I hope you all will support me in this New Year as readers, as fellow blogger friends, as fans and as well-wishers!!! 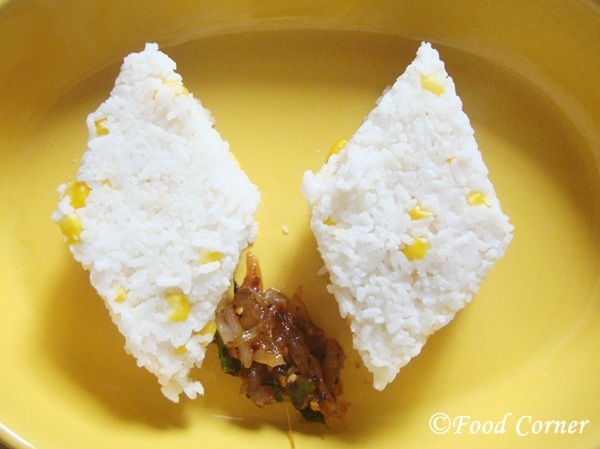 Here is the recipe for Bada Iringu Kiribath which you were waiting for! Prepare one cup of fresh corn and keep aside. Wash rice and put in a rice cooker or a pan. Until the rice is cooking, prepare the coconut milk mixture. For the thick coconut milk, add salt. Stir well. Taste for the salt. When the rice is done add fresh corn and coconut milk and stir well. Steam of rice is enough to cook corn. Cook again for a few more minutes until the coconut milk is absorbed. 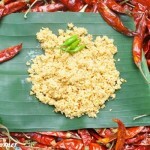 Serve with Chili Paste (Lunu Miris) or Seeni Sambal. WISHING YOU AND FAMILY A VERY HAPPY NEW YEAR. ALL THE BEST FOR 2013. take care. first time i see corn rice- hmm flavorful and pretty. thanks,even I visited through a previous link.dont know why,I miss your posts in the reading list…. 🙂 wish you a Happy New Year too…. Lovely it looks and new to me. new n interesting recipe, perfect shaped bath!!! Hi Amy, interesting rice recipe. With corn and coconut it sure taste very yummy! Take care, my dear! Have a nice day ahead.